Up until 2004, influenza viruses had never been identified in dogs. All that changed when an equine H3N8 virus mutated enough to adapt to a canine host, and began to spread among greyhounds at a Florida race track in 2004 (see EID Journal article Influenza A Virus (H3N8) in Dogs with Respiratory Disease, Florida). Two years later, half-way around the world, another (avian) influenza virus (H3N2) would turn up in domestic dogs in Guangdong Province (see Avian-origin H3N2 canine influenza A viruses in Southern China), and rapidly spread across Asia. In the spring of 2015, the Asian H3N2 Canine flu arrived in America's Midwest (see CDC’s Key Facts On The New H3N2 Canine Flu), and has since sparked outbreaks across much of the nation. 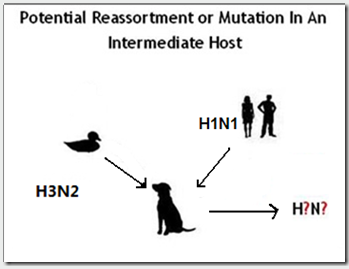 Although currently regarded as a relatively low-risk virus - last summer the CDC added Canine H3N2 to their IRAT (Influenza Risk Assessment Tool) listing of novel flu subtypes/strains that circulate in non-human hosts and are believed to possess some degree of pandemic potential. As companion animals, dogs have unique access to humans, and so we watch the evolution of canine (and feline) influenza viruses closely. All of which brings us to a new Dispatch - published yesterday in the CDC's EID Journal - that describes the emergence and rapid spread of an antigenically distinct canine H3N2 virus with signs of additional mammalian adaptation in China, and presents limited serological evidence of one probable human infection, further raising the zoonotic risks. I've only included some excerpts from a much longer report. Follow the link to read it in its entirety. When you return, I'll have a postscript. CIV usually causes mild respiratory symptoms, and CIV-infected dogs often recover without treatment. As a consequence, animal owners and veterinarians often neglect treating CIV infections, creating an opportunity for CIVs to circulate and further adapt in dogs. Mutations leading to better growth in dogs could enhance infectiousness in other mammals (e.g., humans). Also, CIVs are antigenically novel to the human immune system and, thus, might pose a threat to public health. Therefore, we set out to characterize CIV H3N2 in dogs in China to assess the potential risk to the public. To evaluate whether humans can be infected by CIV H3N2, we collected serum samples from pet owners (n = 50), veterinarians (n = 5), and animal hospital staff (n = 23) who had contact with CIV-positive dogs. Serum from 1 pet owner tested positive for CIV H3N2 (HI titer 80), revealing that this virus is a potential threat to public health. Considering that preadaptation of influenza A(H1N1)pdm09 virus genes to mammalian hosts through prior circulation for several decades in swine might have contributed to the emergence of viruses containing these genes in humans, the potential adaptation of this CIV H3N2 clade to mammals and its public health threat should be further evaluated. Because dog competitions and trade involving different countries are frequent and the surveillance of CIV is limited, studies are needed to determine whether viruses of this CIV H3N2 lineage are prevalent in other countries. Enhanced global active surveillance to monitor the spread of these viruses among dogs is also needed. Such efforts could prevent further CIV spread and adaptation and will be critical for identifying public health threats that could emerge at the animal–human interface. Dr. Lyu is an associate professor at the College of Veterinary Medicine, China Agricultural University, Beijing, China, and a veterinarian at the Veterinary Teaching Hospital of China Agricultural University. Her research interests include diseases that affect dogs and cats. While this study describes antigenic drift in the canine H3N2 virus, resulting in a new clade of the virus, last summer in mBio: Novel Reassortant Influenza A Viruses in Canines in Southern China, we looked at a different, and more dramatic form of viral evolution; antigenic shift (reassortment). Here, by sequencing the complete genomes of 16 IAVs obtained from canines in southern China (Guangxi Zhuang Autonomous Region [Guangxi]) in 2013 to 2015, we demonstrate that the evolution of canine influenza viruses (CIVs) in Asian dogs is increasingly complex, presenting a potential threat to humans. First, two reassortant H1N1 virus genotypes were introduced independently from swine into canines in Guangxi, including one genotype associated with a zoonotic infection. The genomes contain segments from three lineages that circulate in swine in China: North American triple reassortant H3N2, Eurasian avian-like H1N1, and pandemic H1N1. Furthermore, the swine-origin H1N1 viruses have transmitted onward in canines and reassorted with the CIV-H3N2 viruses that circulate endemically in Asian dogs, producing three novel reassortant CIV genotypes (H1N1r, H1N2r, and H3N2r [r stands for reassortant]). A reminder that - even though novel flu news may seem a bit slow right now - influenza viruses continue to evolve, often in places and in hosts out of our sight - and their threat has not diminished.